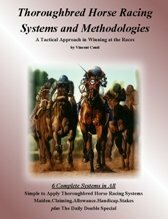 Winning Methods - Systems that Work! Thoroughbred Horse Racing Systems and Methodologies brings you winning methods, horse racing strategy, betting strategy, wager management, wager types and illustrates proven winning results for each system. Another day another dollar. Except today you feel lucky. You're going to the racetrack with some friends so you go to the store bright and early to pick up the daily racing form. Your determined to win, and you want to show your friends that you are a true handicapper that can make each of you profits. You head home and open the paper and get down to the daily grind of handicapping the races. What's your POA? "Plan of Action" as I call it. What are you going after when you get to the track? Daily Double? Pick 3 or Pick 4? How about the Pick 6? Don't know, do not have a plan...just going to see if you can find a winner here and there and try to catch an exacta or two? I guess this works for the average track visitor, but does it work for you? Now lets approach this a little differently. You are determined to win ... you have a small arsenal of proven winning methods in one hand and the racing form in the other hand. You notice in the 3rd race, a claiming race, the #5 horse answers to be a perfect candidate for one of the "claiming race" winning methods. Ok, let's go to the 4th race and apply another angle. A maiden race with twelve starters, five of which are first-time starters. Hmmm, it appears the #8 horse is a good candidate for my maiden race system. OK, we have a pick 3 potential, let's go to the 5th race and see what's running. A Seven horse field posted at six furlongs. An allowance race, but none of the horses qualify for one of the systems. However, the #1 horse has a morning line of 4-5 odds. You gander at its performance and after several minutes of looking throughout the race the #1 looks like he cannot lose. Now do you have a POA? Absolutely. A Pick 3 wager using the horses 5 with 8 with 1. Or how about a race 3 exacta, 5 with All or put the 5 horse on top of the next three likely runners to make it in the money. In the 4th race, how about an exacta 8 with All. Or #8 on top of the next three likely runners to make it in the money. Now you have a plan of action. Now you're better prepared for your handicapping attack when you get to the racetrack. Winning methods can and do make a difference when approaching each race.The scenario you just read can and will make a difference for you, the handicapper, and your racetrack friends. The best part of it all; these racing systems will relieve you of hours and hours of handicapping. These systems eliminate this tedious task by giving you a simple tactical approach...that works! Are you searching the internet for the perfect horse racing system? Well guess what..there are no perfect systems for picking winners but there are racing systems for assisting you in handicapping difficult race match-ups. Chaos races such as maiden races with horses that have never ran a race before, or low level claiming races with horses that average 40+ lifetime races are extremely difficult to handicap and finding a winner. These systems can and will assist your handicapping ability. I proved it over and over again throughout a full year of trial and error. For the price of these systems it's well worth the wager for the gambler in you...I guarantee it! 1 System for ALL types of races! **SPECIAL OFFER** Also included is a top win percentage system titled "The Daily Double Special - The Hidden Money."